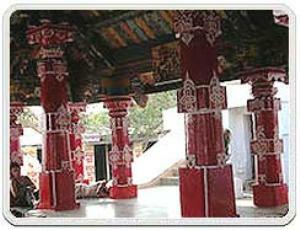 Simhanath Temple is dedicated to Shiva who is worshipped by Nrisimha, an avatar of Vishnu. The temple has a rekha deula and terraced roof jagamohana of traditional phase of temple style of Kalingan order. The temple is unique for its sculptural embellishment of both the Saivaite and Vaishnava cult. It is located in the Gopinathpur village, Baramba tehsil of Cuttack district. It can be easily approached by road from Cuttack, Chaudwar and Athgarh.Situated on an island in the Mahanadi River, about 10 kms. from Badamba in Cuttack District, the Simhanath temple (c. 9th century) is interesting for its images of Shaiva, Shakta, and Vaishnava cults of Hinduism. The jagmohana (porch) appears to be influenced by the Vaital Deul temple in Bhubaneswar. The Simhanath temple combines older features with new and energetic experiments. This can be seen in such things as the elongation of the Paga images which crown the niches, and in the addition of a third terrace to the roof of the jagmohana.